The dome of the reactor containment building has been successfully lowered into place at unit 1 at the Changjiang nuclear power plant on China’s southern island province of Hainan. 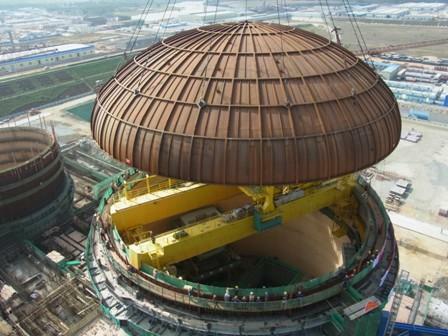 Plant constructor China Nuclear Engineering and Construction Corporation (CNECC) announced that the reactor dome was successfully lifted by crane and placed on top of the containment vessel walls at 10.50am on 28 December. This, the company said, was 28 days ahead of schedule. The operation to install the dome – with a diameter of 37 metres, a height of 11 metres and weighing 180 tonnes – was witnessed by national and regional dignitaries and company representatives who had gathered for a ceremony to mark the event. China National Nuclear Corporation (CNNC) said that the project to construct Changjiang unit 1 now moves from the construction phase to the installation phase. The Changjiang plant, near Hoi Mei Tong village, is being built as a joint venture between CNNC and China Huaneng Group, with shares split 51% and 49%, respectively. The Changjiang plant will eventually comprise four 650 MWe CNP-600 pressurized water reactors and will be built in two phases. Initial approval for the construction was granted by China’s National Developmental and Reform Commission in July 2008. Site works began in December 2008. Construction of Unit 1 began on 25 April 2010, while first concrete for unit 2 was poured on 21 November 2010. Changjiang 1 is scheduled to begin operating by the end of 2014, with unit 2 set to start up the following year. The second phase of the Qinshan nuclear power plant (units 3 and 4) in Zhejiang province, which also comprises two CNP-600 units, is being used as the reference plant for these first Changjiang units.